Punjabi Folk Singer Kanwar Grewal was invited for a stage show at Dera Sirsa. The program was organized by Dera Sirsa administrators related to Gurmeet Ram Rahim’s birthday. 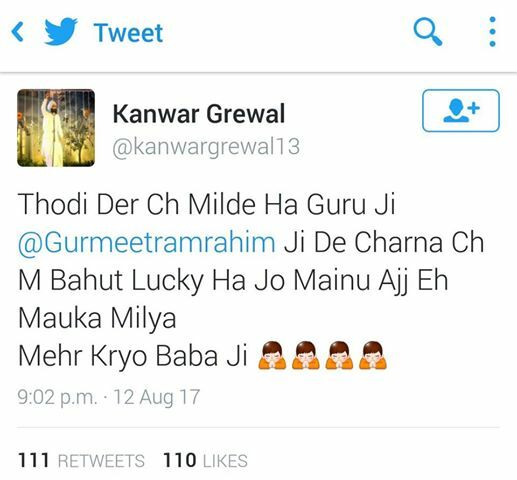 Kanwar Grewal had started talking about Waheguru and Mian Meer, in the presence of the buchar Ram Rahim. Kanwar Grewal kept his talk continue. He also asked the people to say, Waheguru Ji. With this act of him, Sant Ram Rahim seems to be got annoyed by that. Later the administrator of event caught the mic from him and said the next program will be presented by Guru Ji himself. This program of Grewal was going booked for 2 hours. But it shut down in first 15 mins. The video got viral on social media. Some Sikh youth said that when the Hukamnama has been issued against the Sadh from Takht Sahib, then why did Kanwar Grewal need to go there? On the other hand, some Sikh youth say that he spoke of Waheguru instead Dera Guru. Earlier The Sikh organizations and youth protest on his post when Kanwar Grewal shared a view on Facebook about his program at Dera Sirsa.